Whether you are doing graphics/web design work or just taking screenshots, it’s often very difficult to move the mouse precisely enough to select pixels the way you’d like. Here’s a couple of ways to make it better. 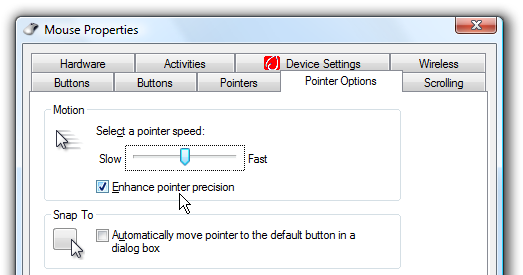 There’s a number of methods you can use, from configuring the default mouse settings, to enabling Mouse Keys to move the mouse pointer with the keyboard, or my favorite: Using the Precision Booster feature in IntelliPoint. If the mouse moves too fast for you, you can always slow down the mouse pointer by opening the Mouse Properties window in Control Panel (either type Mouse into the search box or look in the Hardware section). On the Pointer Options tab you should see the “Enhance pointer precision”, which should be turned on if it isn’t. You can change the mouse pointer to move slower by just dragging the slider. Use Notepad as personel diary..
How Long Has Your System Been Running? How to Detect Trojan Horse . An Interesting Trick to Hide the Data in Notepad. Shutdown Windows XP in less then 5 sec.